Nowadays there are so many different kinds of eye care products available in market like eye pillows, eye patch, eye creams, eye gels, etc. Out of all of them, I think the most innovative and most convenient one are eye patches! 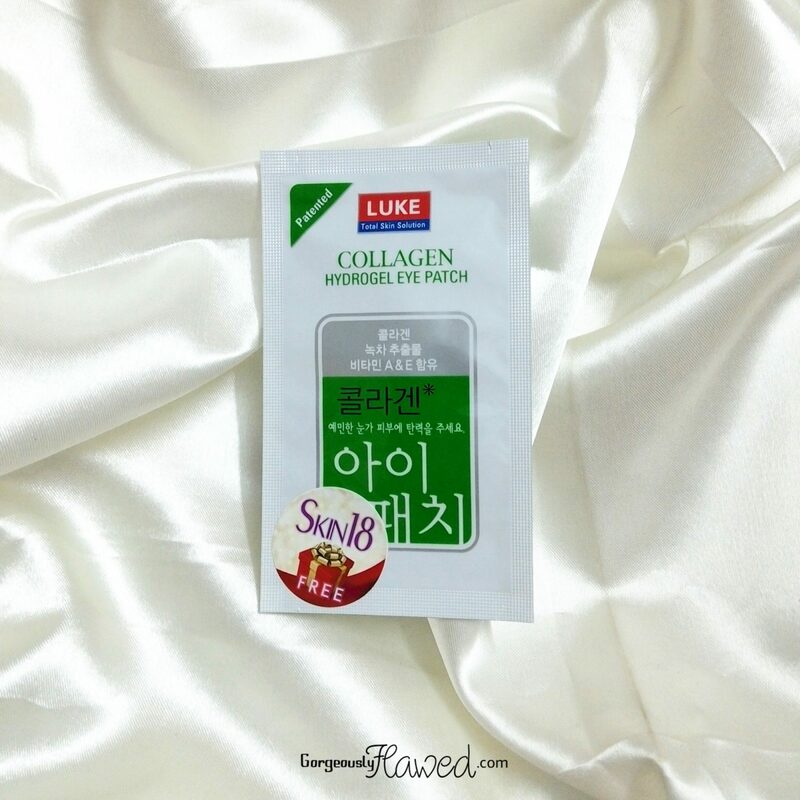 I got a chance to use the Luke Collagen Hydrogel Eye Patch few days back. It’s basically a single satchet with two hydrogel eye patches. 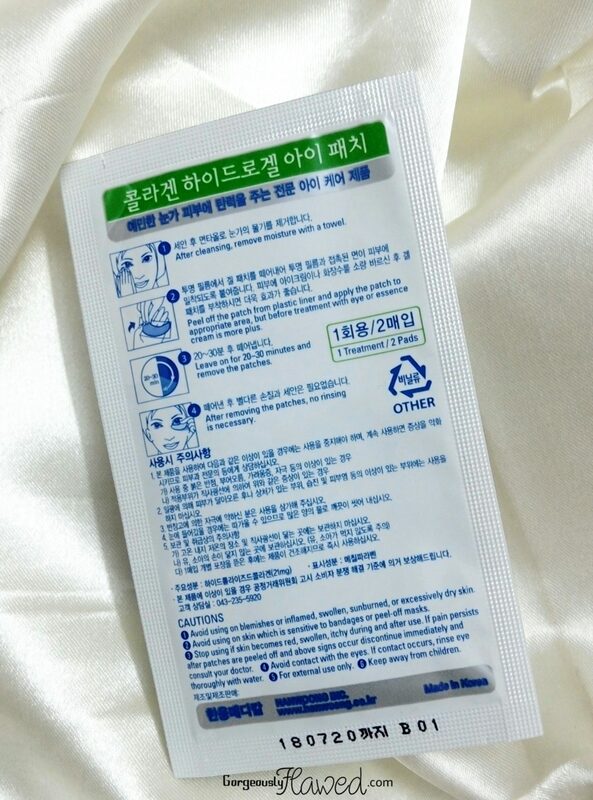 Read on to know more about this product..
• This patch supply intense hydration and relaxation to your tired eyes and deliver nutrients to your eye skin. • [Pito Collagen and Vitamin A, E and C- Elasticity and Moisture] Pito Collagen and Vitamin A and E give nutrition to dry eyes due to moisture being evaporated easily. • [Green Tea Extract – Clean skin] Green tea extract helps maintain sleek and smooth skin which used to have been dark and dry. • [Hydro Gel- Excellent moisturizer] Hydro Gel which richly contains moisture helps to keep healthy and beautiful eyes. • [Transdermal Delivery System – Concentrative nutrition supply] Skin care ingredients of Hydro Gel absorb deeply into your skin so give concentrative supply to the eyes that needed nutrition. • Wrinkles (Red) – starting to have lines under your eyes? this type of eye patch is suggested for those with obvious lines under eyes. Often usage can fade out lines and wrinkle. • Eye Puffiness (Purple) – many people get puffy eyes in the morning or at night because of body or skin tiredness, get the best result to be used in the morning time with those patch to relax under eye area. • Vitamin (Orange) – skin area under eyes need nutrition pumping just like how we need to eat everyday, feed your eyes with “vitamin” which is essential nutrients that your body need in small amounts in order to work properly. 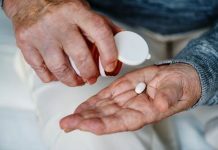 [How to Use] – Easy to apply and remove. After cleansing, dry with a towel. It is helpful to apply eye cream or essence before pasting the patch to your area (not too much), when apply please lightly pat it under eyes area. Peel off the patch from plastic liner and apply onto the desired area. Leave on for 20-30 minutes and remove the patch. The eye patches come attached to clear plastic films. 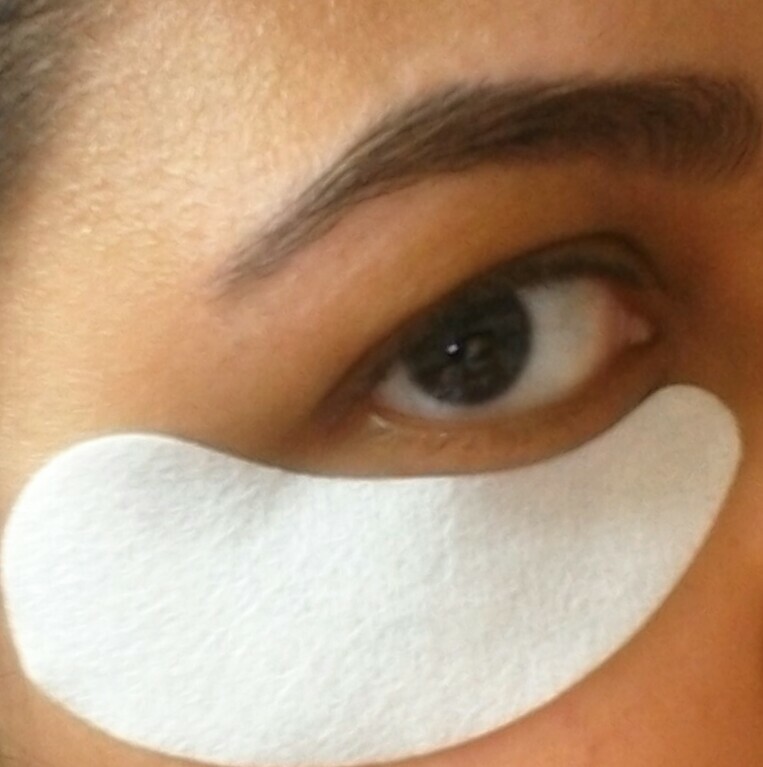 You have to gently Peel off the patches from the films and put them under your eye area. They feel more like stickers and less like hydrogel patches and when I say “stickers”, I really mean it! Once you put them on, they won’t budge until you remove them by yourself. I removed them after keeping them for about 15 minutes because they had started to feel very uncomfortable and stretchy, kinda painful too. These patches are suitable only for those people who have crow’s-feet/wrinkles/eye bags or those who get puffy eyes often. Thankfully, I don’t have any of the aforementioned problems and that’s why I didn’t enjoy using the patches. They only made the skin around my eye area look plump and healthy. This effect didn’t even last long. So far, this is the only Korean Skin care product which has disappointed me a lot, but still, I will recommend it to those people who get puffy eyes often. 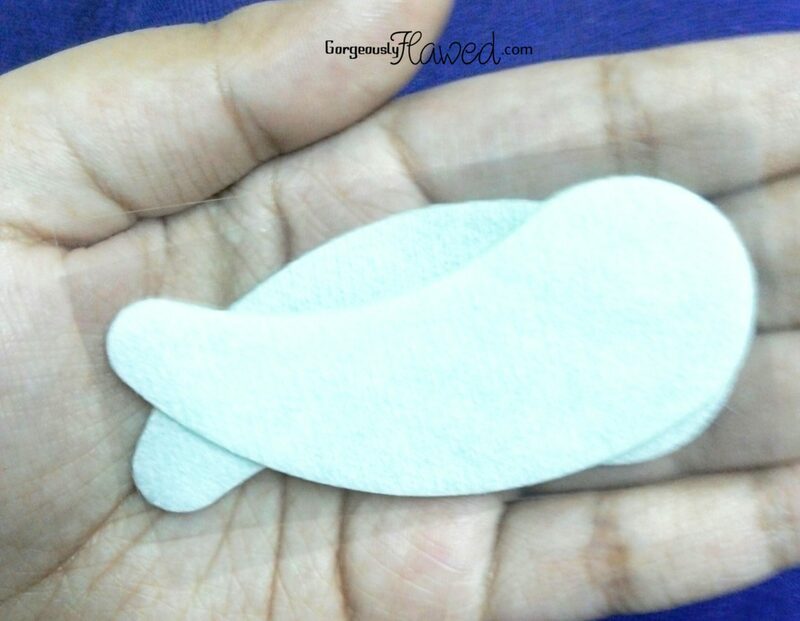 Regular use of these patches can also help you to minimize wrinkles around your eyes so do try them. Have you tried any such product(s) before? Let me know in the comments below. Subscribe for more such updates. I guess leaving the patches for 10 min would be ideal. The fact that the effect of plumping didn’t last long, well, at least it lasted for some minutes, but of course, the more the better. I would like to try these patches, once at least! Wow this is really very helpful post. Always wanted to try korean product, now I know where search for them. This seems like an effective product.